Founded in 1981 by Terry Mckearney, A-1 Vacuum is a family-run business that’s dedicated to providing hotel, motel and restaurant owners with quality cleaning supplies and reliable vacuums. We have nine knowledgeable employees on staff, including Terry’s sons, Peter and Allan, dedicated to providing valuable advice and solutions designed to maintain cleanliness throughout various commercial sectors in PEI. Peter Mckearney joined the business in 1982 which coincided with the addition of janitorial supplies to the list of available products at A-1 Vacuum. At the time, most supplies came from off island. As we continuously expanded and focused on product availability, A-1 Vacuum added hotel/motel supplies to our roster. Terry Mckearney believed in the power of great customer service and word-of-mouth advertising, two essential components that have paid off over the years. Allan Mckearney joined the business in 1988. Diagnosed with a brain tumor in 1995, Terry sold A-1 vacuum to Peter and Allan. It was at that time, fueled by their father’s passion and pride, that they decided to focus on the business’ growth and to provide restaurant supplies to their customers. A diversified product line translated to increased sales and success in new commercial sectors. 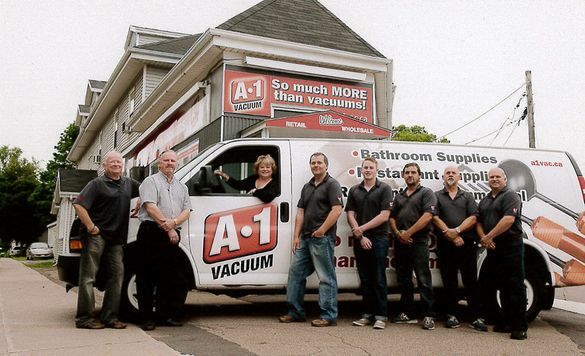 Dedicated to providing quality products and excellent customer service, Peter and Allan believe that A-1 Vacuum’s key to its continued success is to provide the best available products at a fair price, matched with topnotch quality service.